Diablo is all about giving saws that run the gamut from DIY to high-end Pro the best possible performance with great cutting accessories. The best Diablo blades at STAFDA 2018 bring a focus in on expanding your capabilities with your circular and reciprocating saws. With the new 2018 Pro Tool Innovation Award-winning Diablo 7-1/4″ general purpose circular saw blade, you can cut both wood and metal. 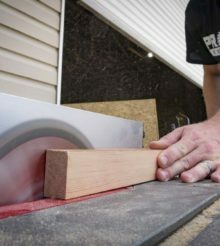 It’s not going to replace your wood or metal blades, but if you’re going to be cutting some of both, this 36-tooth blade is a great option to keep from swapping blades or carrying two saws. You can pick one up for $21.97. It’s also available in a 6-1/2″ size. Diablo’s new 7-1/4″ Steel Demon Cermet blade turns your standard circular saw into a metal cutting beast – even in stainless steel! In the demo we saw, one blade made 50 cuts in stainless and still had life left in it. Whether you’re fabricating or working on plumbing, this $29.97 blade makes your metal cutting life that much easier and more cost efficient! You can grab these in 6-1/2″ and 6-3/4″ sizes as well. Check out more details on these blades here.